Travel to Burma to experience a country that still moves by ox and cart. Meet intriguing tribal peoples who practice little-changed, traditional ways of life. Explore glittering temples filled with candles and incense, where red-robed monks offer prayers to Buddha. 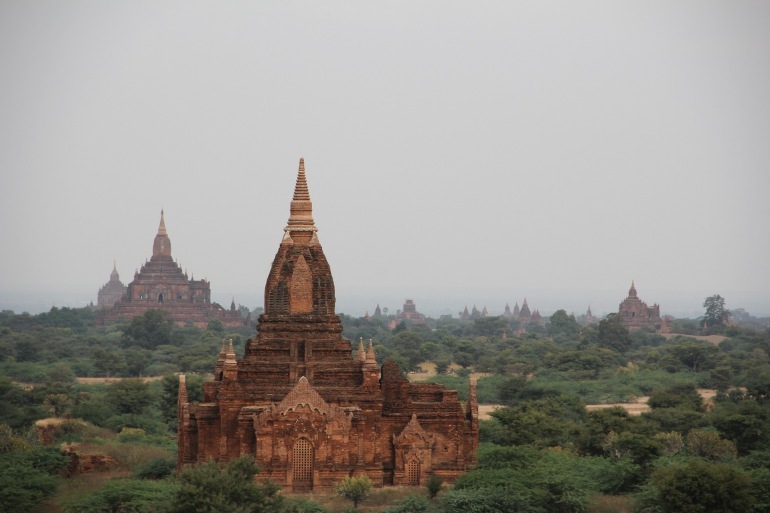 Visit the ruins of Bagan, the pagoda-dotted plain that many consider the greatest sight in Asia. This trip captures the essence of the land we know and love so much. No reviews yet for this trip. Browse other reviews below for Asia Transpacific Journeys. Welcome to Burma. Upon arrival, you will be met and transferred to our hotel to meet our Tour Leader and fellow travelers, and enjoy a welcome dinner. Today we will explore the capital, with its wide avenues, fine Victorian architecture, bustling markets and picturesque water-front. Visit the National Museum, which houses interesting exhibits on Burmese history, culture and ethnic groups. The Lion Throne of King Thibaw, an extraordinary work that stands over twenty feet tall and is covered with carvings depicting scenes from Burmese mythology, is especially intriguing. There will then be time to browse the nearby market stalls in search of eclectic souvenirs, hand-crafted jewelry or traditional sweets. At sunset, visit the Shwedagon Pagoda, the glistening golden stupa that towers over the capital and never fails to enchant visitors. Dinner will be on your own tonight, offering opportunities to explore or relax. This morning, we will fly to Mandalay, arriving midday. The cultural center has many interesting sites, including the Shwenandaw Kyaung Monastery, noted for its fine teak carvings, and the Kuthodaw Pagoda with 729 marble slabs inscribed with the entire Buddhist canon. Then visit a gold-leaf factory and a shop selling woodcarvings, Burmese marionettes and richly-embroidered tapestries called kalagas. Time permitting, we will also prowl the Zegyo Market with its endless panoply of color, hustle and heady aromas. In the afternoon, the lovely countryside around Mandalay is a delight to explore as is the fascinating old city of Amarapura. We will visit a weaver’s workshop, beautiful pagodas, the ruins of the old palace, a Chinese joss house (temple) and shops specializing in cotton and silk longyis (the Burmese-style sarong). Catch sunset before returning to our lodgings for dinner on your own tonight. We will depart early this morning for a journey by bus and ferry to the charming town of Ava, which was the capital between the 14th and 19th centuries. An exploration by horse cart offers a glimpse into the Burma of old: farmers plowing their fields with oxen, ruined pagodas peaking out of the jungle and a marvelous wooden monastery where crimson-clad novices practice reciting Buddhist scripture. We will then make our way down to the jetty to board the RV Paukan and begin our trip down the Irrawaddy. Today, as we float down the majestic Irrawady, stop to visit small riverside villages. Meet the locals, explore their quaint towns and beautiful pagodas. For many, encountering the warm, welcoming locals on these stops is one of highlights of the journey. We will also visit Sagaing Hills, a fascinating site of crumbling pagodas and many active shrines standing watch over the river. When Mandalay was Burma’s capital, Sagaing was the “annex” town that housed hundreds of Buddhist monks. Today, we will continue our leisurely river journey, arriving in Bagan mid-morning. During its golden age in the 12th century, Bagan was known as “the city of four million pagodas.” While Kublai Khan and several massive earthquakes have reduced that inflated number drastically, what remains is still incredible, and rightfully known as one greatest sites in Asia. Over the next two days, we will visit the principal pagodas, some rarely seen stupas, several small villages and the on-site museum. Our expert Tour Leader and knowledgeable local guides will provide insightful explanations of all we see. This afternoon is free to relax or explore on your own. If you like, take a bicycle or horse cart and lose yourself amidst the crumbling spires. Dinner will be on your own tonight. This morning, we will drive south to the little town of Chauk to visit the colorful local market and then continue on to the little- visited hamlet of Salae, home to several working monasteries. Nearby Mt. Popa, an extinct 5,000-foot volcano beckons. It is the traditional home of the Mahagirinats (animistic spirits) and an important pilgrimage site. Everything about the place is dramatic—the lush vegetation on the mountain slopes, the petrified forest along the road and the complex of monasteries perched on unlikely crags. After lunch, we will return to Bagan for an afternoon of free time. This evening, we will reconvene for dinner at a favorite local restaurant, accompanied by a marionette performance. Visit the spectacular Shwezigon Pagoda at first light. (Note: if you have pre-booked the optional Oriental Ballooning excursion, instead depart early this morning for this wondrous adventure.) Reconvene for lunch and then continue exploring with a visit to Ananda. Built in 1090, the whitewashed and gilded Ananda is an amazingly well-preserved temple. Tonight, we will enjoy a special private dinner party on the grounds of our hotel. This morning, we will fly to Heho and then travel overland to Inle Lake. Private boats will complete the transfer to our hotel.Dinner is on your own this evening. Today, we will visit a local tribal market, which rotate through villages in the region. These fascinating hodgepodges of brightly colored flowers, flopping fish and local goods, offer the opportunity for various tribal peoples and villagers to not only buy and sell their wares, but also catch up on the latest news. We will then board a boat for Indein, a 16th-century temple complex, and another spectacular piece of Burma’s vast cultural wealth. Enjoy lunch at Nam Pan village and visit with local silk weavers, boat makers, cheroot makers and blacksmiths. The remainder of the afternoon will be spent exploring beautiful Inle Lake. We will see the famous Intha fishermen rowing their fishing boats with a swirling move of their leg, pass floating gardens (villagers actually grow tidy rows of vegetables on the lake’s surface), stop at a weaving village and visit several Shan temples. We will also pay a visit to the Mine Thauk Orphanage, which we have been supporting for many years. End the day with snacks and a wine tasting at the Red Mountain Estate Vineyard and Winery. Since its founding in 2002, French wine maker, Francois Raynal, has imported over 400,000 vines from Spain and France along with the best European equipment and is producing exciting, young wines from Burma. His wines are the first ever made in the country. Today, continue exploring the lake region with activities of your choosing. Hop on a bicycle and ride to a local market, savor the tranquility of our lake side lodgings or take a leisurely walk along the foothills to access more local flavor and natural landscapes. Tonight, we will reconvene for a farewell dinner. This morning, we will transfer to Heho and fly to Yangon. After lunch at the Strand Hotel, you will be transferred to the airport for your flights home or to begin a private extension. The deposit is $1,000 per person and must be received to begin confirmation of an itinerary. Payment of your deposit indicates agreement to our Terms & Conditions and agreement to complete, sign and return our Application, Waiver and Release of Liability. A $200,000 Emergency Medical Evacuation policy, and a $5,000 Emergency Medical Insurance and Assistance policy. We cannot vary from our stated refund policy regardless of your situation. For this reason, we recommend that you buy travel insurance immediately upon booking your travel arrangements. See Travel Insurance section above for more information. Correspondence regarding land or air cancellation must be sent via email, mail or fax. There may be circumstances where non-refundable full payments or deposits have been made on your behalf for airfare, ship or other charters, hotel or other custom arrangements that will supersede the above policies. You must be 18 years old (except for minors accompanied by a parent or designated responsible adult) and in acceptable health to travel on one of our tours. Acceptance of your booking is subject to our review of your application. We retain the right to request medical clearance or any other information or to refuse any applicant for any tour at any time for any reason whatsoever, at our sole discretion.